StarTrek New Generations-episodes 2 of 3.
planet Deneb IV, also known as Farpoint, to pick up the remainder of its crew. gaged in negotiation, who constructed Farpoint Station as a gift to Starfleet. plead guilty. Q allows 24 hours for Picard to prove humans are NOT savage. team into the corridors under Farpoint while a strange ship enters orbit. collapse, to discover why the USS Tsiolkovsky hasn't answered its hailing. and goes to Deanna Troi's quarters, seeking exotic material for clothing. strange virus that overran a previous Enterprise commanded by James T. Kirk. time to complete the board and for Worf to send them into warp speed away. most likely work quite well. smoke atop a plateau an apparition of a face forms, warning them all to speak. to fight and when not to fight," by responding "Fear is the true enemy." puzzles are beamed over to the Ferengi ship. sode shown out of film order. hitting target in our galaxy before phasing once again, out of eternity. and the ship continues toward its next mission. to make its deadline at Parliament. But Deanna senses the Captain's presence. Guests: Brenda Bakke (Rivan); Jay Louden (Liator); Josh Clark (Conn); David Q.
tem for an important conference, and the Enterprise is ordered to report there. 2893, a Constellation-class cruiser that was under Picard's command long ago. haunting memories of the past. ship. He does so, and all appear aboard the Enterprise. The Q Grid vanishes. a Klingon woman. Worf turns her away, and Wesley asks for his childhood back. to normal....with something of an understand between Captain and First Officer. that bids them greetings, tells them that "Lwaxana Troi and the Miller Family"
Deanna's garish mother, Lwaxana Troi, beams aboard with her manservant, Mr.
allowed it the other way. original series. Robert Ellenstein played the President in STAR TREK IV. could visit the life of his favorite character. this is Wesley, who is removed from the bridge when he tries to tell Picard. three go to the cargo deck, where Lore is attempting to contact the Crystal. to the bridge, knowing a bit more about himself. indicate there has been no peace with that culture. 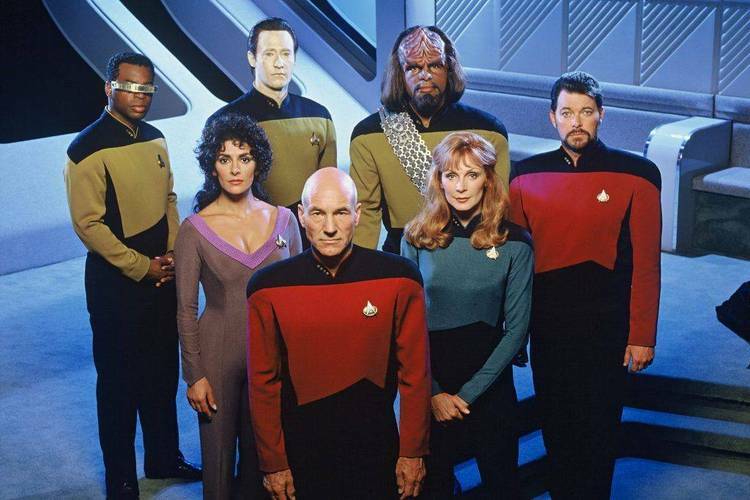 holodeck and brief shore leave for the crew before a rendezvous at Pelius V.
go off for a game of Parrises Squares, Geordi is teaching Data to paint and Dr.
Crusher is preparing for a meeting with renowned Professor Terence Epstein. him, informing him that a relationship with Minuette was just not meant to be. Women" and "The Mark of Gideon" of the original series. Karnas weapons to defeat his enemies but gave the same to the opposite side. ries episode "The Trouble With Tribbles". the worst with children, is presented with a gift from Alexandra. order to begin an investigation, into a topic the Admiral will not go in to. ship finds the SS Battress, a Telarian cargo vessel extremely off its course. courteous. The Enterprise speeds off to Starbase 84.
field. Picard and Beverly beam down, leaving Geordi in command of the ship. David Marcus in STAR TREK II and III. Tasha beam down to the surface Veigra Two, near the shuttlecraft crash site. Natasha Yar, Chief of Security of the USS Enterprise, in silence. Denise Crosby as Tasha Yar. from Walker Keel, an old friend who served with him on the Stargazer long ago. Communications Officer in "Star Trek IV: The Voyage Home". tioning and carrying frozen humans. The three containers are beamed aboard. Earth, where they will be able to adjust to a new life. first time in Trek that an actual year is given to date the shows: 2364.